Übermittelgroß, sehr typ- u. ausdrucksvoll, sehr gut pigmentiert. Sehr gute Knochenkraft, sehr korrekte Gebäudeverhältnisse, hoher, ausgeprägter Widerrist, fester Rücken, gute Kruppe, sehr gute Schulterblattlänge u. -lage. Gute Oberarmlänge u. -lage, korrekt gewinkelte Hinterhand, runde, kraftvoll bemuskelte Keule, gute Brustverhältnisse, gerade Front, hinten u. vorne geradetretend, sehr flüchtige, raumschaffende Gänge. Wesen sicher, TSB ausgeprägt; läßt nicht ab. i like to know what Ober is producing in his pups as health goes, good or bad. I am in Australia and have purchased now 3 dogs from Hans-Peter Reiker (Bad Boll Kennels) and imported to Australia. My friends also recently purchased a dog from Hans-Peter Reiker (Sept 2012). All are fanastic dogs and the support provided by Hans-Peter and his lovely wife Renate was world class. I would not import a dog to Australia from anyone but Hans-Peter (Bad Boll). be buying high priced puppies if you don't know enough about the breed. gsds has many problems it doesnt matter where they're coming from, on the other hand there are many good things about them...be a smart buyer. SV judges have suggested Ober should not assist again to the Siegerschau. 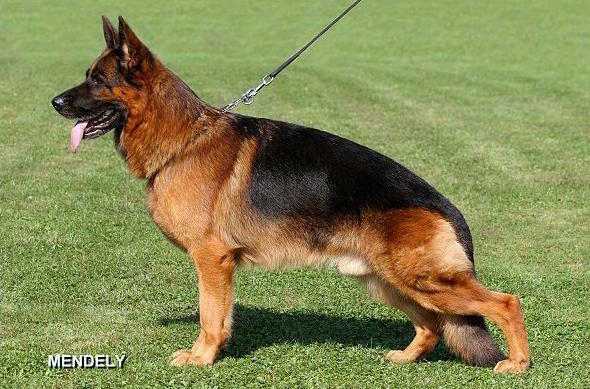 There are plenty of beautiful dogs so this year we must surely have a new Sieger. Anyone knows if Ober will be in BSZS 2011 ? First of all Breeder and Dealer are two different things. Hans-Peter Rieker can be a good breeder but when it comes to being a dealer for sales he is bad. We have went to Germany to visit him. He might be good to you while your meeting him in person but it doesnt mean that he is a good dealer to everyone else. Our review that we have wrote doesnt just come from us but its from the long talks that I had with other breeders that have a lot of breeder experience and the best place to find this review is on Pedigree database GSD. We want people around the world to read this so they could make their decision on either to buy or not to buy a puppy from Von Bad Boll because we dont want anyone to go trought all the trouble that we went trought and still going trought with our dog as he has Hips Displasia. Just take a close look at a photo of Ohio-Von Bad Boll. We are not afraid to say all this and go against Hans Peter Rieker even though he is a judge and knows a lot of SV Judges. We are not afraid and we dont want anyone to go trough all this hardship and pain that we are going trough right now! We have talked to Hans-Peter when were buying a puppy that he was very skinny but Hans-Peter was promising us that the dog will be in very good Body Structure and Healthy condition and we believed him. He has lied to us and we are not putting ourselfs down for this review but it is Hans-Peter who is putting himself down. He will never sell good puppies to people as he keeps good puppies to himself and he's friends and weaker puppies who arent good for him he sells them to other people of the world. I belive that Bad-Boll kennel is one of the most renowned kennel and the most recognized kennel all across the world, coming up with some great dogs like VA1 Rikkor von Bad-Boll and VA1 Ober von Bad-boll, after getting such high standard no one will give such kind of a puppy, the way your describing on the database, i have seen Obada von Bad-Boll litter sister of you dog an have also seen her peroforming in the ring, she is one the best females to come to India which is been given by Mr .Rikkor to contribute to the gene pool in india, she is a well constructed female with good pedigree,she is absolutly a great mover. I would just like to advice you that if your conveying your personal comments on a public website, kindly find out yourself that do you truly deserve to do so, coz everybody knows in the world that Mr.Hans Peter Rikkor is always been a very good advisor and has given good suggestion to the biggners and experience people,he is been with this breed from several years and bred some very beautiful dogs,i beilive putting this type of comment on the database shows tht you are really unaware of the breed,so i would say please understand the breed and give your comments, coz if you say such things on the database you are putting yourself down infront of everyone. First off all I tell you that I have a litter sister of your dog her name is Obada von bad boll she is super female and goes V4 under SV Judge Herr.Rainer Mast in just age of 2 years 1 day with 18 females on this ring. How come you say that Hans Peter will Give u Sick Puppy its totally wrong whatever I know about these people if the dog is sick he didn¿t allow to give you, But I m so strange that after 2 yrs you got the problem however when u buy a puppy from him that time yours eyes ill close or u didn¿t know that puppy is sick after 2 yrs you recognized that this dog is got a problem¿.and who told u that Hans Peter is worst Dealers in GSD.if he is worst so how come he Breed 2 VA1 dog in the History .I m fully satisfied with Hans Peter and Renate and those people who buy dog from them ¿.I think first you learn yours subject what is GSD then passed comment. I thought you not taking good care of yours dog and you blame on them¿. Who is you and How Come you recommend people, People knows what is right and what is wrong I tell you I didn¿t go any other breeder to buy GSD. I got one more Dog from his Kennel on upcoming show season¿. I tell you don¿t write anything wrong when u didn¿t know about them I personally visited Germany and know how they are; I love their devotion and dedication with dogs. Have bought the puppy in kennel von Bad Boll. Litter from Ober von Bad-Boll and Visa von Bad-Boll. Puppies were very thin, but Hans-Peter Rieker us assured that they normal and that it simply would not feed them that we could see structure of a body. When we have taken away the puppy from it there was a diarrhea. Later he failed a blood test (RABIES). Now to a dog almost 2 years, but till now structure of a body it is those, small bones, flat ribs, small chest and a small head. On show took the last a place. Probably if not a breeders name, it would disqualify with show. The some people have told us that Hans-Peter one of the worst dealers of the world. Recently vet.told that the dog is ill at it INSUFFICIENTIA PANCREATICA EXOCRINICA (PANCREES) and he dont know how long he have to live. We even to the enemy would not advise to buy the puppy from Hans-Peter. If you havent got a famous kennel he would never sale you a good puppy. We have mated our female with this excellent male! Congratulation to the owner and breeder! Congratulation. We are from Poland. It's a very beautiful dog, and we are fan of him. Would anyone be able to tell me how to get in touch with the owner ? congratulation to owner and the breeder of absolute stunning male with best of his progeny and all the credit goes to breeder to breed such great producer. all the best keep it up. congrates to all behind this stunning dog. Congrats Team Bad boll and Imran Sahib on the well deserved victory. Cheeeeerrrrssss. Yogesh Tuteja. India. Congrats to Team Bad boll for this male!! Ober or Yerom will be VA1 2010.
go for sieger! You are simply the BEST. A stunning male. Best choice for VA1 this ear. The best balanced dog in Germany today after Zamp. He tracks absolutely parallel behind despite the deep angulation and long stifle . Fantastic male he was superb in Ulm and lovely dashing progeny out of this male . BRAVO. He looked superb in Ulm and so did his progeny. Congratulations VA5! Congratulations on Ober VA 5. He has matured into a Beautiful Male. Lovely Progeny too. A Stunning male indeed....Congrats to the proud Owners! LOVE, LOVE, this dog my fav, awesome colour and much quality, and great young progeny from him. Well done he looked a star in the big ring. Congratulation!!! Ober's bite work was awesome, he is a beautiful male who has matured into a exceptional dog full of quality, i think he will push them all hard next year for the top spot. grattis.. VA5. bszs 2009 in ulm. regards from kennel gipsygården in denmark. Hope you place better in the future I am sure he can do that, he is beautiful!!!! Ober has some fantastic progeny growing up, He's a cracking male with lovely breeding. good look at the Sieger show. I FIGLI SONO MERAVIGLIOSI PER TIPO COLORI E CARATTERE , VERAMENTRE DA CONSIGLIARE SOPRATUTTO PER LA MEDIA TAGLIA. AUGURO A OBER DI FARE L'AUSLESE 2009. I wish him best luck for future,very nice dog with good blodline. Wow!!!! What a stunning looking dog. We have a beautiful litter by this superb male. Best wishes for 2009 with Ober. Check out the site www.bad-boll.com. Also check the site www.schaeferhunde.com lot of great dogs listed with the contact details. Anyone know contact info on the owner of this dog?